Two Bears Farm and the Three Cubs: Merry Christmas! We are weirdos that open our presents on Christmas Eve. Well, at least those of you that have more self-discipline and wait until Christmas think us weirdos. I got some really fun running stuff from Paul. Two new running movies Running the Sahara and A Race for the Soul (a documentary on Western States). I also got some Moeben running sleeves. You can put these on with a t-shirt in marginal weather, and then remove them so easily if you get too warm. And finally, a handmade Hawaiian running amulet. These are supposed to bring good running luck. 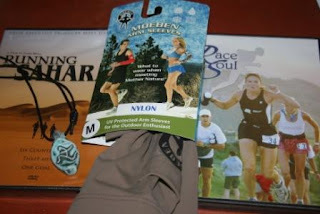 All of these items came from zombierunner.com, which has the coolest stuff AND they always send you some free goodie with your shipment (this time some energizing ginger chews). 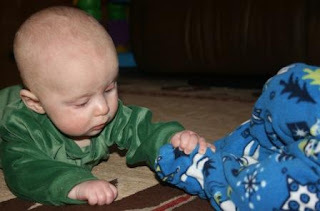 Cort spent Christmas Eve harassing Reid by grabbing on to his foot. He sure does like to pick on his brother. 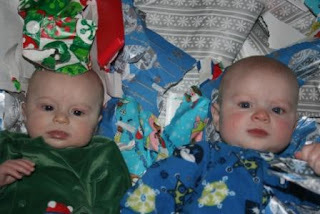 Cort and Reid didn't get much, as they spent their Christmas money on diapers, being the practical babies that they are. 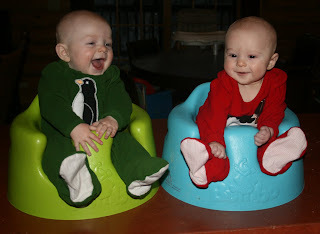 But they did have fun in the aftermath. 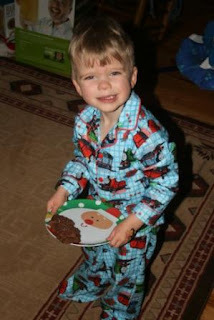 Pierce and I made chocolate spritz cookies for Santa. Here he is carefully carrying them to the tree, hoping not to dump them on the floor. 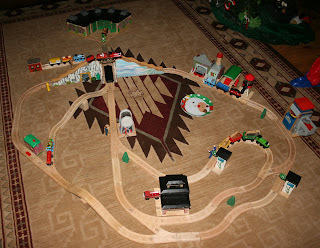 After Pierce went to bed, Santa came and got out all his trains. He set up this spread with materials that Pierce already had, plus a few new additions. 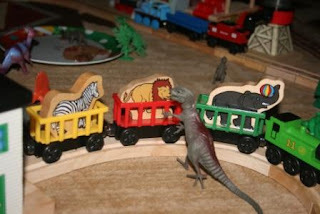 And then the whole thing was taken over by dinosaurs. They even got into the crumbs that Santa left behind. Awwwww. What a fun Christmas morning!